Introduced in Update 2.3 as part of the Enchantment feature, the Enchantment League introduced a new way for Trainers to face each other in battle and win materials needed for enchanting. The Enchantment League is unlocked once the Trainer has at least three Level 16 Dragons. It can then be accessed through the button on the bottom left of the screen. In the Enchantment League, Trainers compete against one another by attacking and defending their home bases in order to win exclusive prizes and materials used to enchant Dragons. 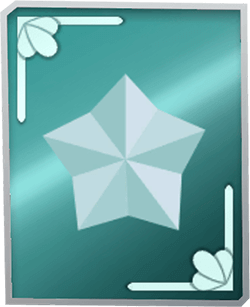 Whenever a Trainer is promoted to a higher league, they will receive either an exclusive decoration or Dragon. Each reward may only be received once. Trainers are not demoted as soon as they fall under the amount necessary for promotion, but rather whenever they fall 20 trophies below it. For example, a Trainer in League 4 will only get demoted to League 3 if they have 580 trophies or fewer. A Trainer will select the Dragons and potions they wish to take into battle while being able to view limited information about their opponent. If the Trainer wishes not to battle the offered opponent, they may pay a fee to refresh to a new opponent. The fee charged for refreshing is based on the level of the league they Trainer is currently in. The amount of Dragons a Trainer can take into the battle depends upon the highest league they were promoted to. Extra slots for Dragons get unlocked whenever the Trainer is promoted to certain leagues and remain unlocked even if the Trainer gets demoted to a league previous to the one where an extra slot was given. After a battle has ended, there is a cooldown period for the attacking Dragons to regain their health based upon how much health they have remaining. The time can be sped up in exchange for Gems. 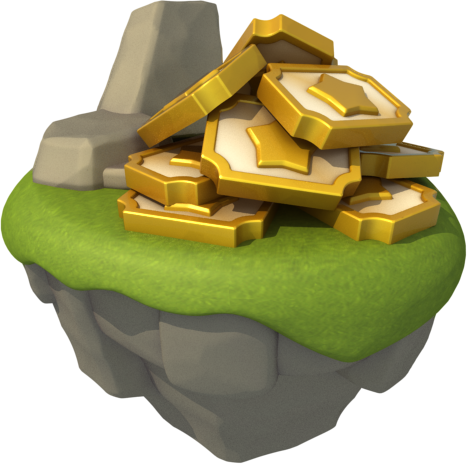 Inside a battle, the cost to speed up the regeneration will always be 5 Gems more than the amount of Gems needed to regenerate the Dragon from the pre-battle interface. Thus, for example, in the pre-battle interface, a Trainer will need to pay 20 Gems to instantly regenerate a Dragon with 0%, whereas for the same Dragon, the Trainer will need to pay 25 Gems during the battle. 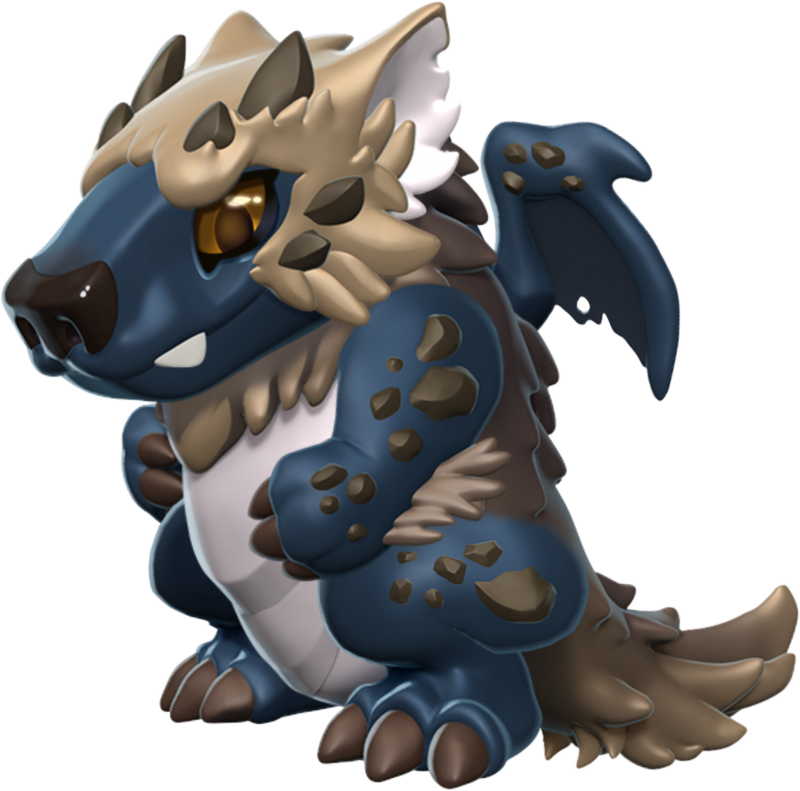 Selecting this option allows Trainers to select which of their Dragons, enchanted or not, will defend their home base against attacks from other Trainers. 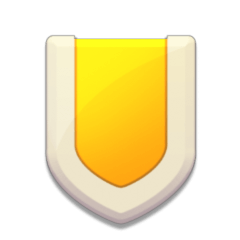 Here the Trainer is able to see how many defenders they can assign to protect their base, as well as the banner of their current league and the rewards received from it. The amount of defenders a Trainer can have depends upon the highest league they were promoted to. Extra forts get unlocked whenever the Trainer is promoted to certain leagues and remain unlocked even if the Trainer gets demoted to a league previous to the one where an extra fort was given. 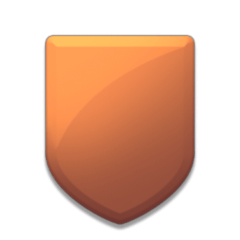 Forts having a icon atop them indicate that they are undefended. To assign a Dragon to an undefended fort, the fort must be selected, the button must be pressed and, from the given list, a Dragon must be chosen. 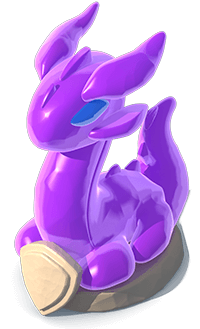 The desired Dragon can be found either through scrolling through the list, through the button to filter the list by its Element, or through the button to search by its name. If the Trainer wishes to remove a Dragon from a fort, the desired fort must be selected, then the button must be pressed and a window will pop up, informing the Trainer that changing defenders resets the timer of the Enchantment Cauldron. From here, if the Trainer still wishes to proceed with removing the Dragon, the option must be chosen. If the Trainer tries removing a defender while there are available potions to be claimed, a window will appear with the option to claim them. 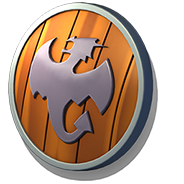 Forts cannot be left undefended , thus, if the Trainer tries to close the Defenders menu without assigning defenders to forts, the game will automatically select any of the Trainer's top Dragons and present them to the Trainer who has the option to either press the button or close the window and select other defenders. Also, in this section, there is a small floating window showing the current level of the cauldron, as well as the average level of the defenders. 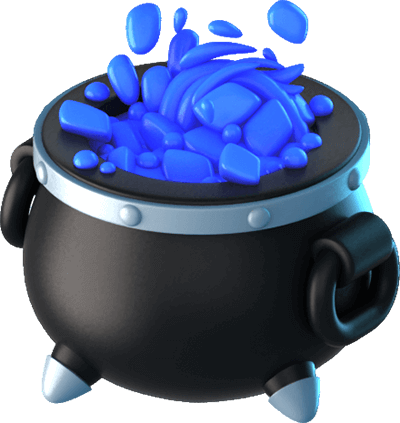 Next to the level of the cauldron, the option can be chosen to see information about the cauldrons. 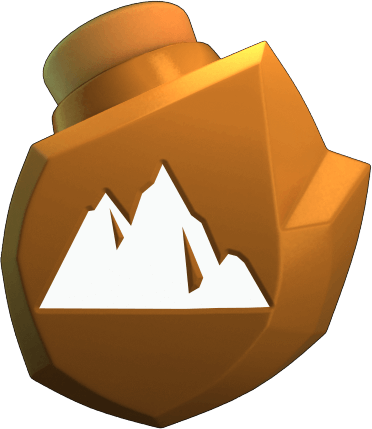 If the Trainer's cauldron has finished brewing potions, the button will be made available under the cauldron and pressing it will take the Trainer to the Cauldron Shop from where they can press the button again to claim the brewed potions or buy any of the other two cauldrons. If there are no available potions, the button will be shown instead of the aforementioned button and pressing it will take the Trainer to the same shop. The Enchantment League rankings serve no other purpose than to compare the number of trophies of Trainers that are on the same platform and server. Once 2,000 trophies are obtained, no further reward is given to Trainers. 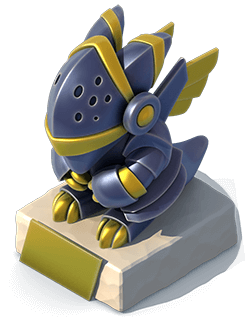 Once 75 trophies are attained, the Trainer can no longer drop below this amount, regardless of how many battles they lose. The last tab is to compare their trophies to Trainers who are in the vicinity of the Trainer in the rankings. In any of the tabs, the button next to any Trainer's name can be pressed to bring up the option used for visiting that Trainer's island or the option to see the current Clan that Trainer is part of. The Battle Log shows a chronological accounting of the twenty most recent battles won and lost against other Trainers, whether initiated by the Trainer or opponent. Once the Battle Log is accessed, the recent battles and a brief information account is listed. This list give the outcome, battle stance, opponent, local date/time of battle, and the number of trophy points awarded or lost. 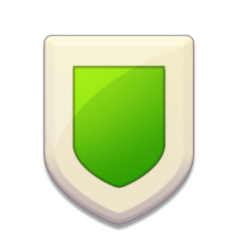 The icon next to the battle outcome shows the Trainer's battle stance; the icon indicates they initiated the attack while the icon indicates they defended against an attacker. Choosing the button to the right of a specific battle will bring up a more detailed account of that battle, such as the amount of trophies each Trainer had at the time of the battle, the Dragons used on both sides as well as those who were defeated, and the types of potions the attacking Trainer used and against which of the defending Trainer's Dragons. If the Trainer chooses to retreat before initiating the battle, they will lose no trophies and the battle will not show up on the Battle Log, even though the post-battle screen will declare the retreating Trainer as the loser. Enchantment Tickets are used to purchase cauldrons and chests of the highest rarity. Enchantment Tickets can be bought individually or in a bundle in exchange for Gems. Purchasing these tickets activates a confirmation window pop-up and the Trainer has to confirm the choice by pressing the button. 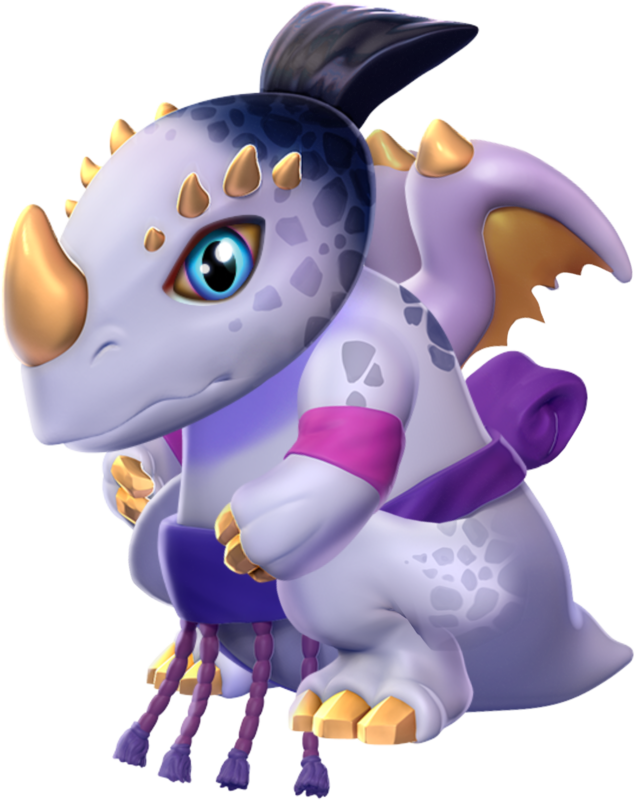 These tickets can also be obtained through the Whale-Mart, Dragon League and Dragon Collector Leaderboard, or earned through various events, mainly Calendar Events, or other occasions. Chests contain Enchantment Materials, Enchanted Trinkets and, in some cases, potions. 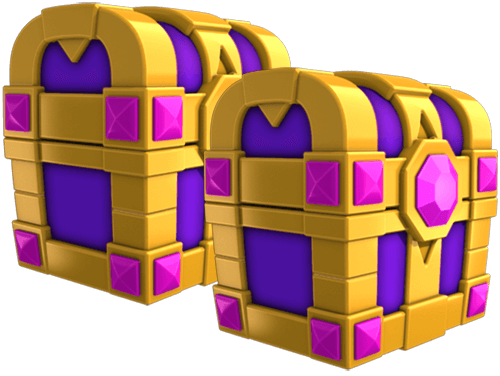 Chests can be obtained by winning battles in the Enchantment League, purchasing them with Enchantment Tickets, and watching ads. Chests are also awarded as special prizes for quests or events. 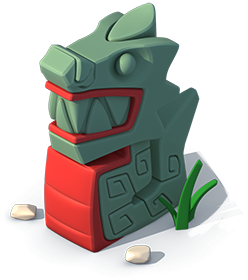 When the Trainer is on the last fort (the last opposing Dragon) and they are down to their last Dragon, if the two Dragons knock each other out, the Trainer will still be awarded with a chest. Keys are required for opening chests after winning a battle in the Enchantment League. Each key will open one chest. The energy bar holds five keys. The amount is increased when the VIP Status is active. 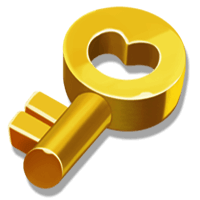 VIP levels 1-9 receive two additional keys, VIP levels 10-18 receive three keys and VIP levels 19-20 receive four keys, thus the Trainer can have a maximum of nine keys. Other than by having VIP membership, there is no other way to increase the maximum base amount of keys. The keys will automatically regenerate at a rate of one every 60 minutes up to the maximum base amount. Keys can also be purchased instantly for 25 Gems each. If a battle is won and the Trainer has no keys, the Trainer will receive league credit for the battle but will not be able to open the chest prize. If a chest is not opened at the time of awarding it is permanently forfeited. When this occurs, the Trainer will be given the option to purchase all the available keys at the end of the battle. 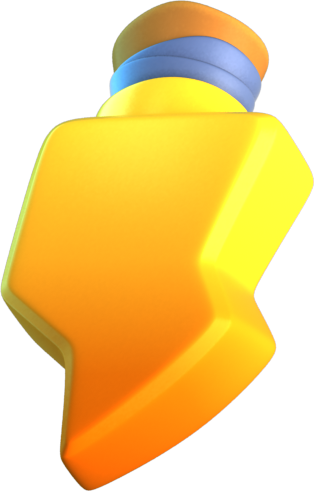 Each chest will give a certain number of Materials Cards containing materials for all the Elements in the game. Each individual card has a certain percentage for the frequency of each Element that varies with lower Elements being more frequent than higher ones. The amounts, however, are the same for all of the materials of any Element. The better a chest is, the more and better materials it will give. All the materials in the game are represented by the cards. Values marked with indicate those non-Divine amounts of Enchantment Materials that have a higher probability of being obtained, whereas values marked with symbolize those Enchantment Materials that are guaranteed to be obtained. 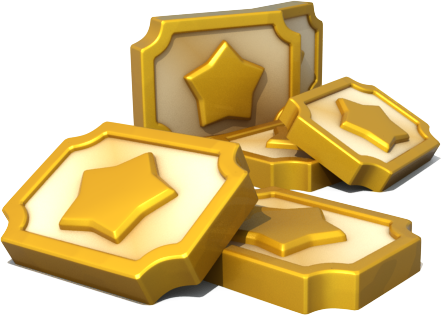 As the percentages apply per card and not per the entire content of the chest, at least one non-Divine Material Card will disregard the applicable percentages in order to guarantee the aforementioned types of materials. 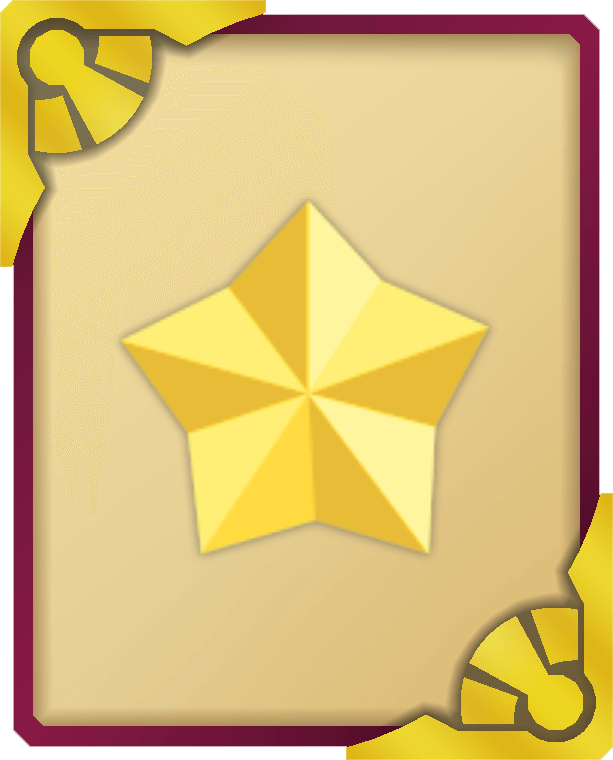 The Divine Material has its own card and different awarding background with clouds. Additionally, this kind of material does not follow the amount and frequency listed in the tables of this section in this article. The Divine Material card has a 40% chance of appearing after the regular material and potion cards have been claimed. Only one Divine Material card is given, regardless of the chest, and its quality will always be average in League Chests under the 5th tier of the Enchantment League and in Gift Chests and average or better in League Chests from the 5th tier and above and in Battle Chests, Rare Chests and Epic Chests. Each chest has a button in the top-right corner of its snapshot that is used to display the number of material cards and the frequency and amount of the materials obtained from that chest. Additionally, in the very same screen, there is another button that, when pressed, brings up an official list of drop rates of materials by quality. 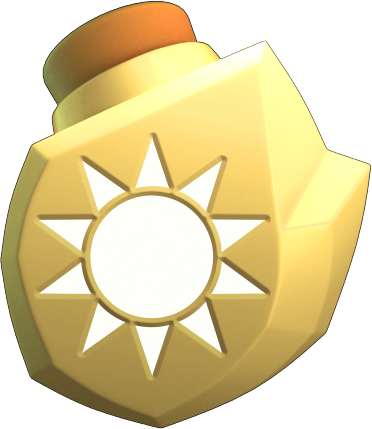 In addition to purchasing, Rare Chests can also be awarded randomly after a victory. The drop rate is random and it is increasing the more victories are won, regardless of any losses between victories, where close to twenty is almost guaranteed a chest will be awarded. The progress toward those victories is always carried over, even if the Trainer left the game at any point, up until the chest is awarded. The only condition is for the Trainer to have opened all chests won from those battles. After the chest is obtained, the drop rate is refreshed and there is no cooldown before it can be obtained again. This chest can only be obtained from League 4 ( 600+) onward. 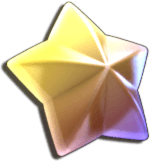 It is awarded every time the Trainer wins five battles within a period of 24 hours, regardless of any losses between victories. 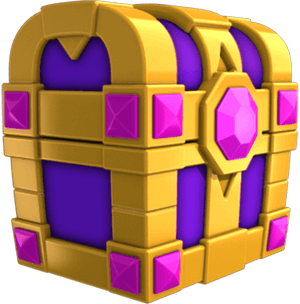 After a chest is obtained, a period of 24 hours must pass before another chest can be obtained again. If a Trainer is demoted from League 4, they will not lose any progress toward the chest (and can win the remaining battles and chests) so long as they are promoted back to League 4 within 24 hours after the first victory. Gift Chests are chests that can be obtained every 6 hours by watching a video. They can also be obtained through events. Their contents vary in accordance to the league the Trainer is in. 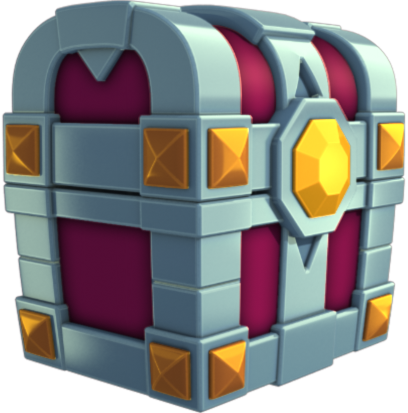 Each tier in the league has its own type of chest associated with it. Chests of higher tiers of the Enchantment League grant more Enchantment Materials and Enchantment Materials of a higher grade. Information about each chest, except the one from the first league, can be accessed through the button after accessing the menu where the promotion prize for each league can be seen. 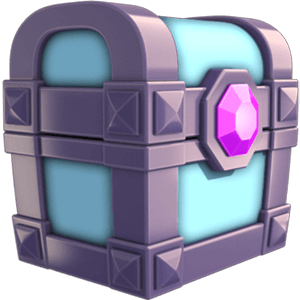 The type of chest awarded after battling depends on the league the defeated opponent is in at the time of battle rather than the Trainer's current league. The Super League Chest is an enhanced version of the League Chest from the league the opposing Trainer is currently in. 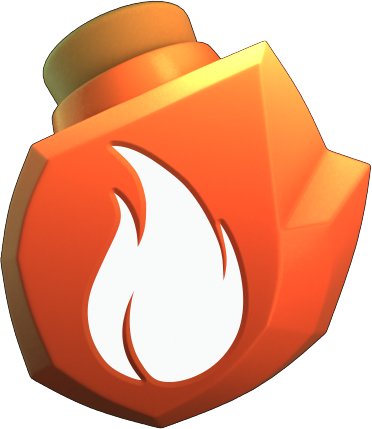 The Trainer receives the same number of material cards and potions as the current chest of the league of the opposing Trainer, but the quality of the materials tends to be higher. 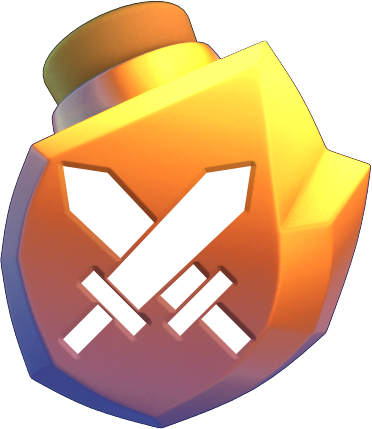 This chest has a chance of being awarded randomly after any victory, but the chance slightly increases after each battle won. On some occasions, chests containing guaranteed materials for a certain type of material, either in regard to quality or Element, can be made available in exchange for Enchantment Tickets. 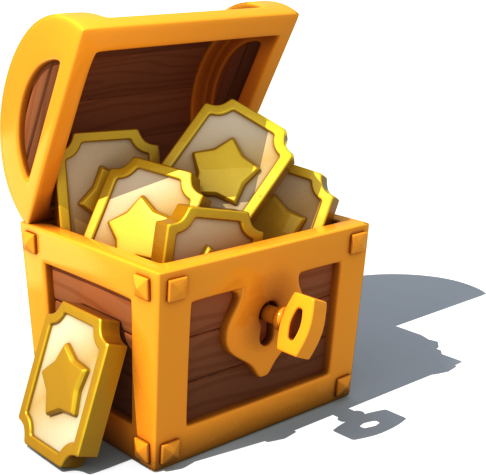 The Giant Starter Chest offers guaranteed low-quality materials and costs 4 tickets while the Legendary Chest offers guaranteed Legendary Materials and costs 8 tickets. The drop rates for Enchantment Materials by quality for some Enchantment Chests are officially stated by Gameloft through the button that appears after displaying the contents of any chest. 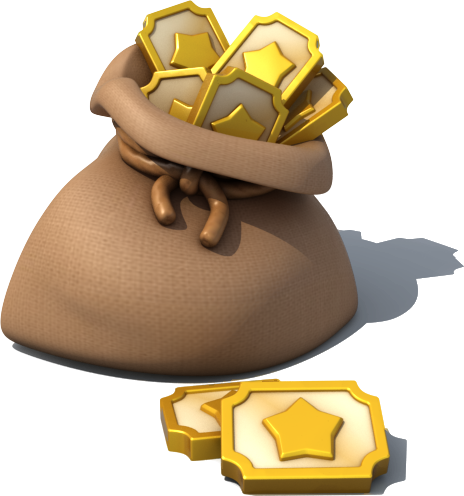 The list was last updated on the 23rd of July 2018 and the displayed amounts below show the average number of materials obtained in every 100 chests opened. 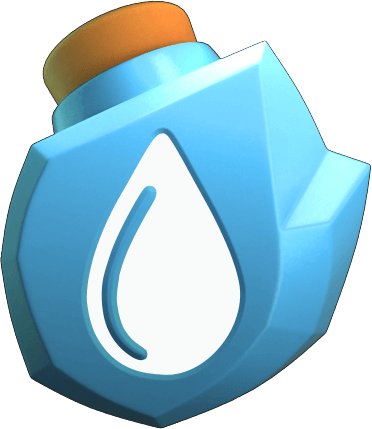 In order to begin using potions in battles, the tutorial for potions will need to be completed. This can be done by first visiting the Cauldron Shop from where the game will guide the Trainer through it. 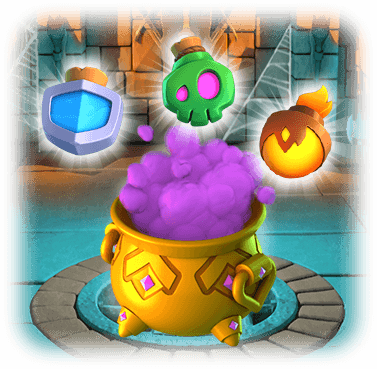 Once the tutorial is complete, potions can be obtained through chests by winning battles, brewing them in Enchantment Cauldrons, or purchasing cauldrons with Enchantment Tickets. 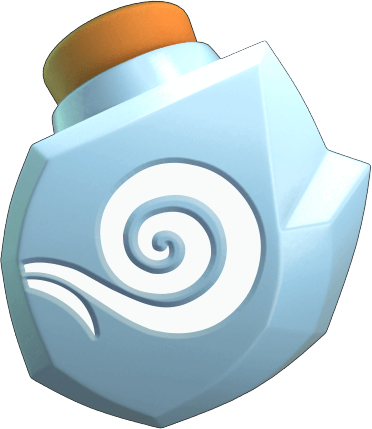 Once defenses are set in the Enchantment League, potions will begin brewing and can be collected once every 3 hours. 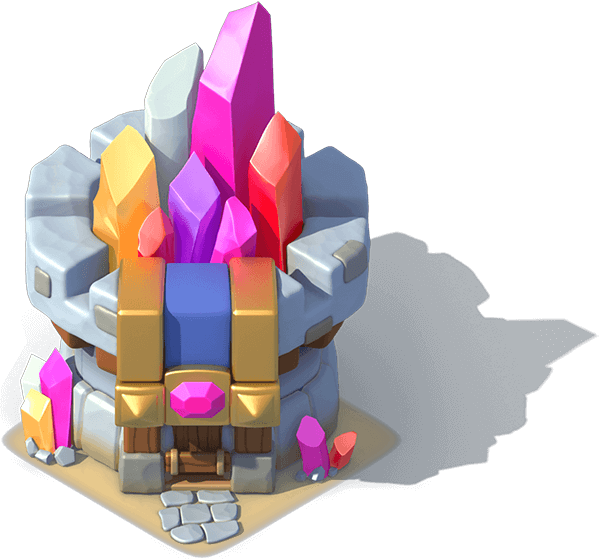 The defense of the island from attacks has no bearing on brewing potions, only the average level of Dragons set to defend. The average level of the defender Dragons will determine the rarity of the potions that will be given; the higher the average, the rarer the potion. 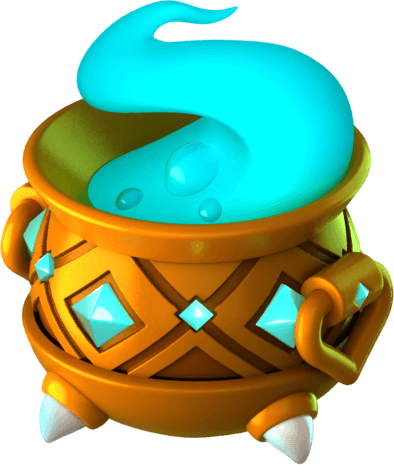 The level of the cauldron will determine the number of potions that are received. 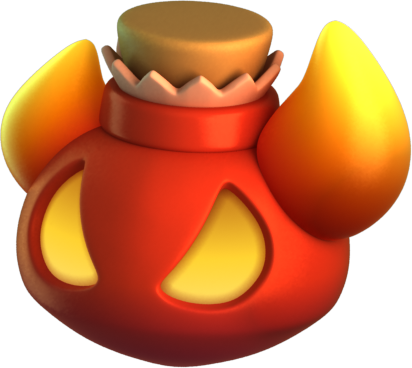 Cauldron Levels 1-4 will give three potions while a Level 5 cauldron will give four potions. 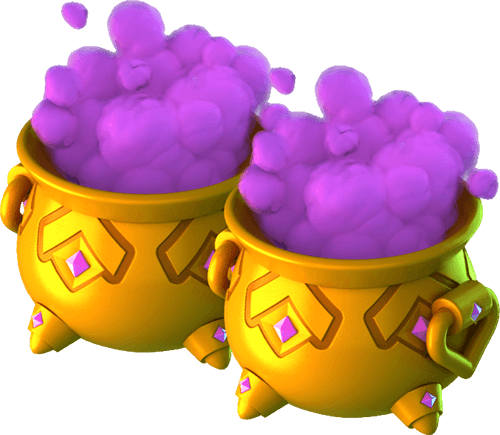 The other two remaining cauldrons can only be purchased in exchange for Enchantment Tickets and one will give six potions while the other will give twelve potions. 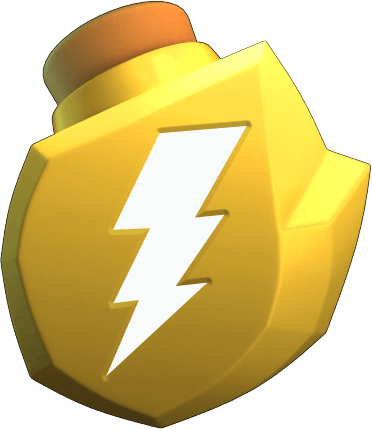 Potions can also be obtained from the League Chests. Each chest gives one potion of various rarities. 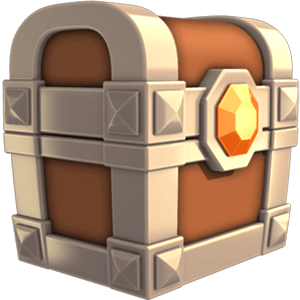 The League 1 Chest gives a Common potion, the League 2 Chest gives either a Common or an Uncommon potion and the other types of chests all give Common to Rare potions. 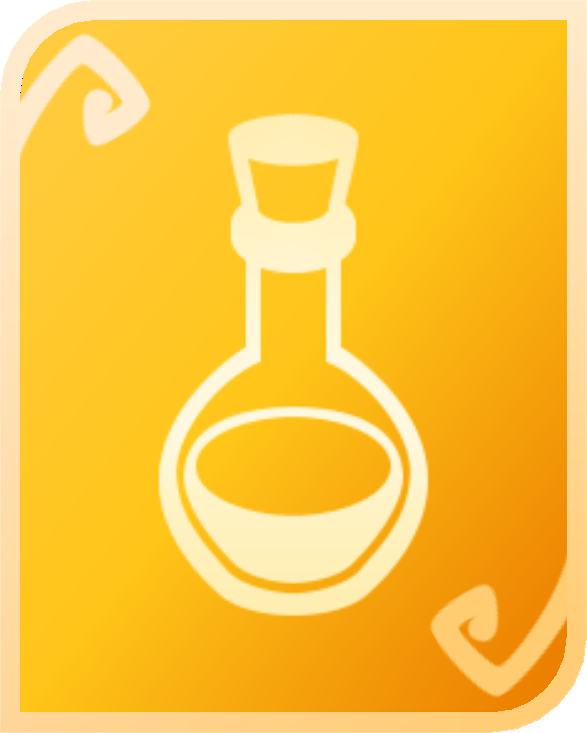 Potions are stored in an infinite inventory that can hold as many potions as are collected from battles and defense Dragons. Trainers can take a maximum of five potions into a battle with VIP Trainers having an additional slot. 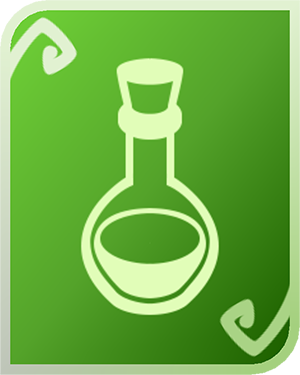 Any potions that are not used during battle, or when a Trainer decides to quit midway through a battle, will not be lost. However, using any potion will count as beginning a battle. Thus, if the Trainer decides to quit the battle after using their potion, they will lose ranking. 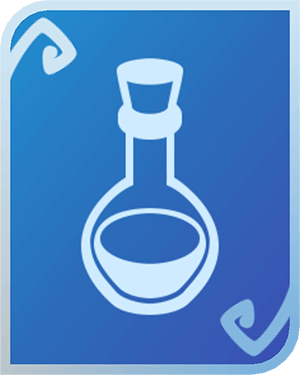 There are two types of potions - Instant Potions and Assigned Potions. 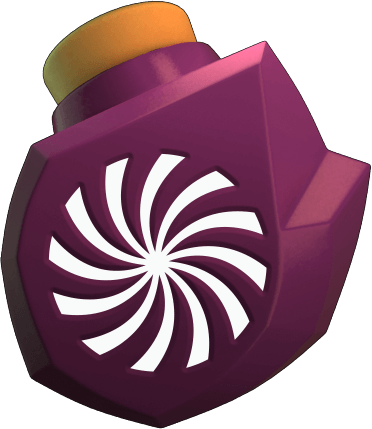 Instant Potions can be used multiple times against the same fort, but only before initiating the fight against it. Minor Damage - The defender of the fort instantly loses 60% of its health. Damage - The defender of the fort instantly loses 85% of its health. 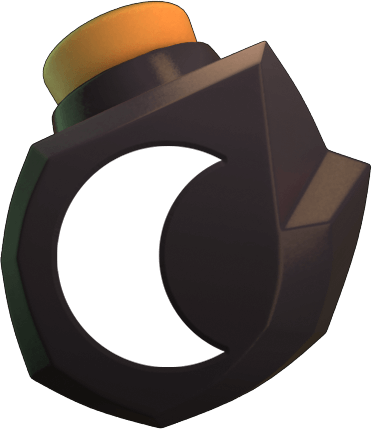 Knockout - The defender of the fort instantly loses 100% of its health. 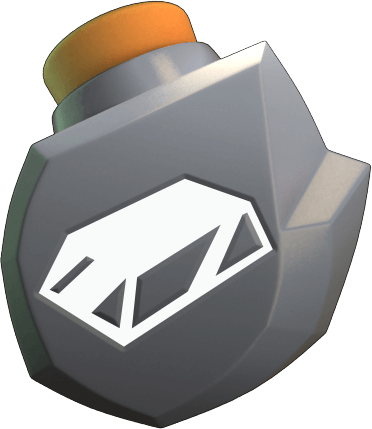 Reveal All - Instantly reveals all defenders by showing them as well as their levels and Elements. 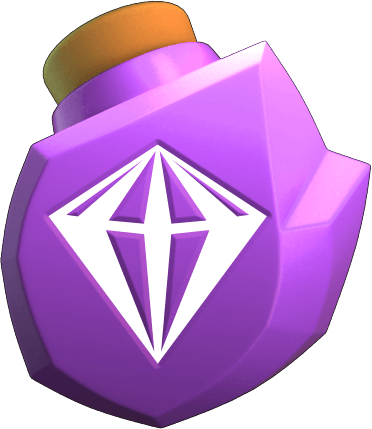 Assigned Potions can only be used on the enemy fort that is currently active. Only one potion can be assigned to one fort at a time and that potion will remain active until the enemy Dragon is defeated, regardless of how many Dragons benefit from it. Minor Curse - Fort defender loses 20% of its health every turn. Major Curse - Fort defender loses 40% of its health every turn. First Hit - The Trainer's Dragon gets an extra preemptive attack that drains 20% of the defender's health. Major First Hit - The Trainer's Dragon gets an extra preemptive attack that drains 40% of the defender's health. 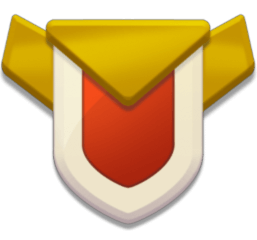 Minor Shield - The Trainer's Dragon's received damage is reduced by 40%. 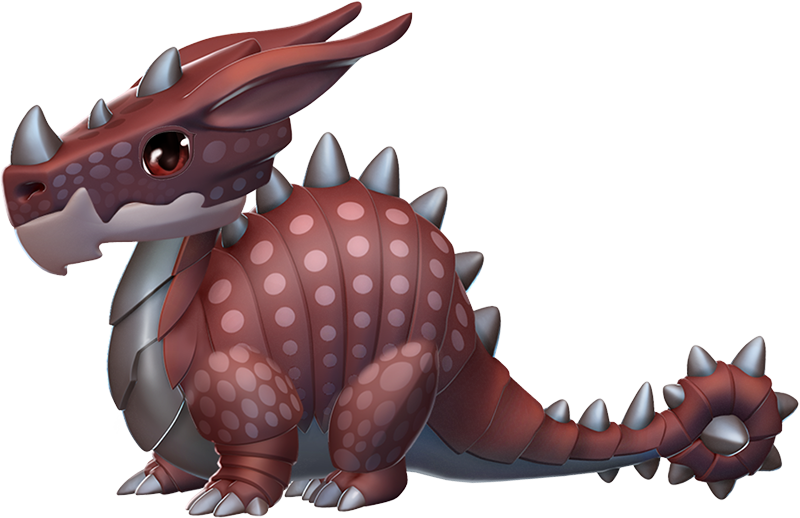 Shield - The Trainer's Dragon's received damage is reduced by 60%. Major Shield - The Trainer's Dragon's received damage is reduced by 70%. 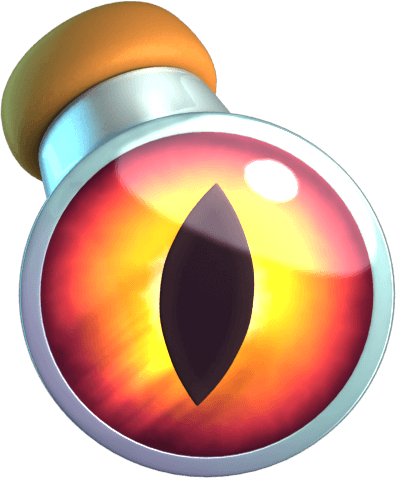 Final Vengeance - If the Trainer's attacker is defeated, the defender Dragon's health is reduced by 50%. Rage - 50% of the Trainer's Dragon's missing health converts to damage when it attacks. 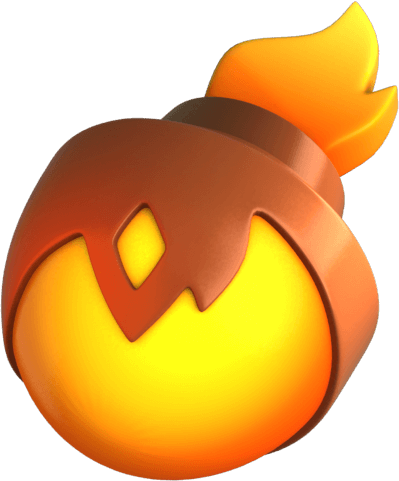 Fire Damage Boost - The Trainer's Dragons with the Fire Element will deal 2x damage. Wind Damage Boost - The Trainer's Dragons with the Wind Element will deal 2x damage. Earth Damage Boost - The Trainer's Dragons with the Earth Element will deal 2x damage. Water Damage Boost - The Trainer's Dragons with the Water Element will deal 2x damage. 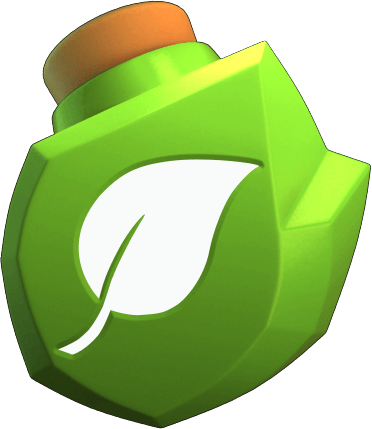 Plant Damage Boost - The Trainer's Dragons with the Plant Element will deal 3x damage. Metal Damage Boost - The Trainer's Dragons with the Metal Element will deal 3x damage. Energy Damage Boost - The Trainer's Dragons with the Energy Element will deal 3x damage. Void Damage Boost - The Trainer's Dragons with the Void Element will deal 3x damage. Light Damage Boost - The Trainer's Dragons with the Light Element will deal 6x damage. Shadow Damage Boost - The Trainer's Dragons with the Shadow Element will deal 6x damage. Legendary Damage Boost - The Trainer's Dragons with the Legendary Element will deal 7x damage. Damage Boost - The Trainer's Dragons will deal 21x damage. The Cauldron Shop can also be accessed from the Defenders section. Likewise, pressing the tab will take the Trainer to the latter section. 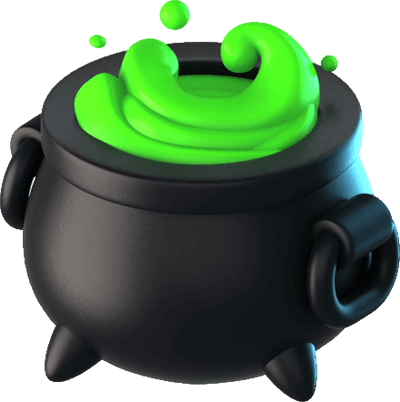 In the top-left corner of the regular caldron, the can be pressed to display all of the six possible levels of the cauldron and the average level needed to obtain them. 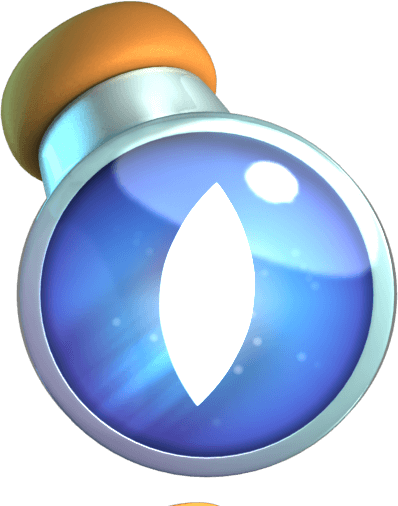 The same button also appears in the corner of the other types of cauldrons and pressing it will display an official list of drop rates of potions by rarity. 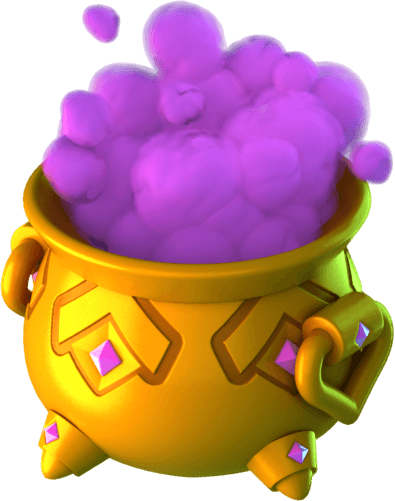 On some occasions, the Seasonal Cauldron can be made available in exchange for Enchantment Tickets. 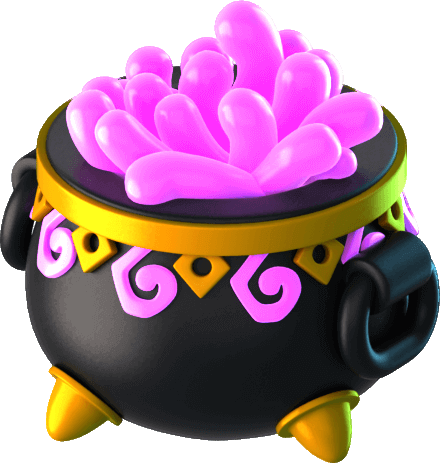 This is an enhanced version of the Pro Cauldron that costs 4 Enchantment Tickets and has a higher chance of giving Legendary potions. 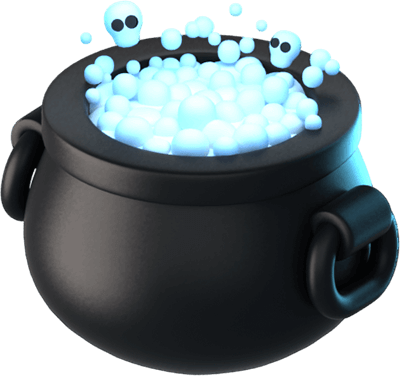 The drop rates for potions by rarity for the Pro Cauldron are officially stated by Gameloft through the button that appears on the snapshot of every cauldron, except for the regular one. The list was last updated on the 23rd of July 2018 and the displayed amounts below show the average number of potions obtained in every 100 cauldrons opened. Update 4.3 slightly altered the background of the snapshots in the Enchantment Chest Shop. Update 4.0 made it possible for Enchantment Chests in League 5 and higher to give Divine Materials of a better quality than average. Starting with this update, chests from League 6 and 7 and chests purchasable only through Gems will now offer 20% more materials and Enchanted Trinkets. Enchantment Tickets can now also be purchased in increments of 100 and 45 in addition to 10 and 1. 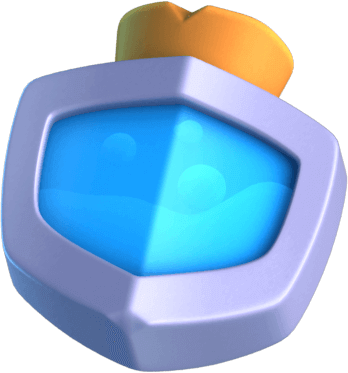 The pre-battle interface no longer displays a featured defender of the opponent, but rather their strongest defender, meaning that the Reveal Strongest Potion , which revealed the strongest defender from the battle, was discontinued. All existing potions in a Trainer's inventory were replaced by the Reveal All Potion. 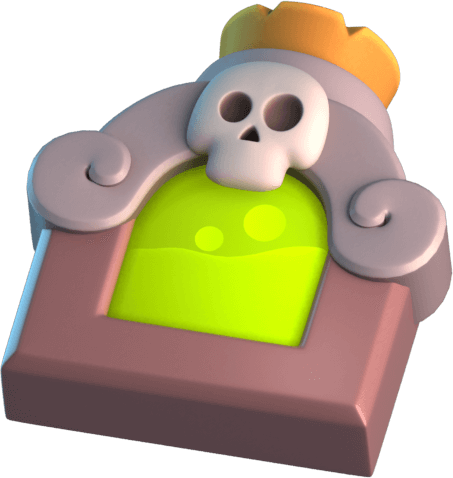 Double Cauldrons and Epic Chests will now reveal all of their contents at once by tapping them once instead of twice. Additionally, opening them can now also be done through the button. 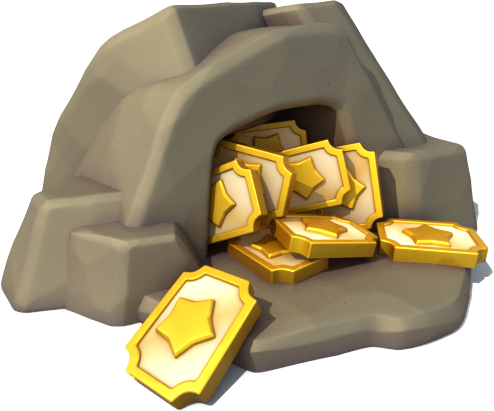 Update 3.8 discontinued the method of obtaining Gift Chests through Daily Quests as the latter were redesigned as Daily Tasks. Update 3.7 added the total amount of keys available to the top-right corner of the button for accessing the Enchantment League (after accessing the Enchantment Menu). Obtaining Enchantment Tickets and Enchantment Materials can now also be done through the newly-introduced Whale-Mart. Update 3.6 made the total amount of keys the Trainer currently has to be visible on the button. 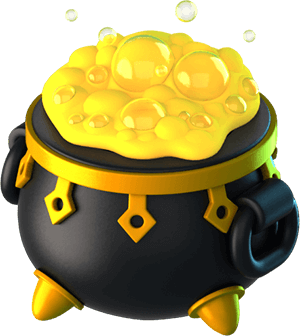 An additional button has been added to chests and cauldrons which is used to display an official list of drop rates. The icon was replaced by the icon. Update 3.4 introduced a yellow-bordered, white background for the Enchantment Tickets. Update 3.3 introduced Enchantment Tickets as the new and only means for buying chests and cauldrons. 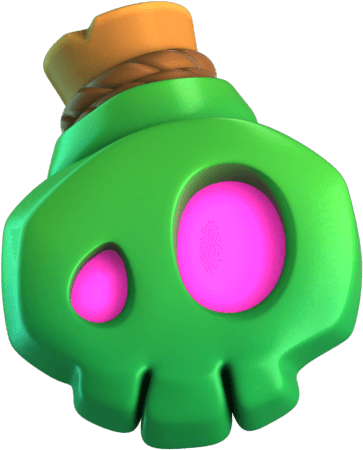 Before this update, the cost of buying the Rare Chest and Epic Chest was 150 Gems and 250 Gems respectively, while the cost of buying the Pro Cauldron and Double Cauldron was 100 Gems and 150 Gems respectively. Update 3.2 discontinued the possibility of watching videos when the Trainer has no keys left. Update 3.2 increased the limit of keys given to Trainers of higher higher VIP levels. Update 3.0 brought slight visual changes to opening chests and claiming potions from the cauldrons. Now the chests emit a bright glow upon opening. Update 2.7 introduced potions and the Battle Chest, as well as the requirement to use keys for opening chests after winning a battle in the Enchantment League. 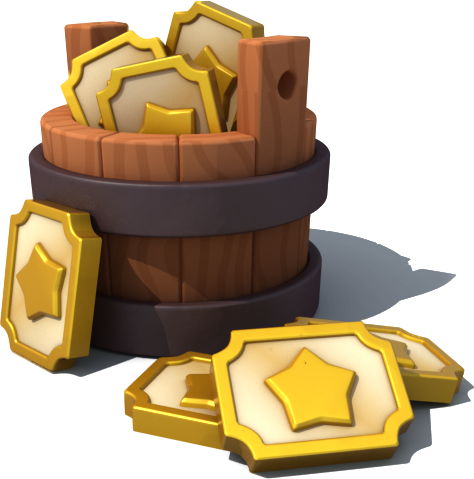 Before this update, the Super League Chest was rewarded on, approximately, the 9th and the 19th wins, now being awarded randomly. Additionally, the Rare Chest was awarded after twenty victories and there was a certain period of time that had to pass before it could be obtained again. 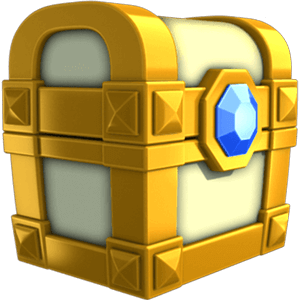 The Epic Chest was called the Marvelous Chest while chests, in general, were called Magic Chests. The cost to refresh was different, as well. 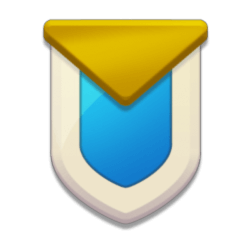 Update 2.5 modified battles so that the retreating Trainer no longer loses trophies as long as they have not undertaken any action that counts as starting the battle. Update 2.4 awarded the Trainer with a Rare Chest after every consecutive streak of ten victories. However, if the Trainer left the game while in the middle of a streak, the streak was interrupted. This page was last edited on 26 February 2019, at 06:50.